Princeton resident Krystal Knapp’s independent news website, Planet Princeton, has 8,300 Facebook likes and more than 7,000 Twitter followers. When it comes to breaking news in Princeton today, the most likely source isn’t a regional daily newspaper or even one of the town’s weekly ‘institutions,’ the Princeton Packet and Town Topics. It’s Planet Princeton, a news website that for five years now has consistently done what very few media organizations, in Princeton or anywhere, still do well: true community journalism. 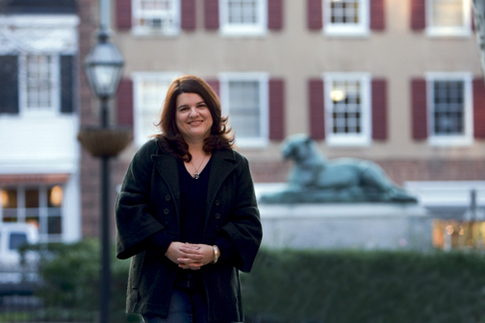 In 2014, Planet Princeton and its founder and editor, Krystal Knapp, gained national attention for being the first to report that NBC News medical correspondent Nancy Snyderman, a Princeton resident, had broken a voluntary quarantine after potentially being exposed to Ebola. In February, Planet Princeton again generated national notice when Princeton University professor Imani Perry accused Princeton police of racism after they arrested her on an outstanding warrant. Perry is black. Planet Princeton was the first to publish dashcam video from the arrest that appeared to clear officers of wrongdoing — later confirmed by the county prosecutor’s office. The incident generated a massive amount of online debate, not all of it civil, and a lot of it taking place in the comments section of Planet Princeton. In both January and February of this year, Planet Princeton had more than 250,000 page views. Knapp, a native of Detroit, has lived in Princeton for more than two decades. After graduating from Smith College in Massachusetts, she came to town to study at Princeton Theological Seminary, where she earned a master’s degree in divinity. While at PTS, she did an internship at New Jersey State Prison as a chaplain. One of the prisoners she was counseling, Michael Bunch, told her he was innocent, and she began to believe him. She learned about Centurion Ministries, the Princeton-based group that works to free innocent people from prison, and worked for them on a volunteer basis for a few years before going back to finish her degree. She decided she wanted to become a journalist based on her experience with Centurion Ministries. “I’d always loved writing, but had considered myself too shy to become a reporter. I was able to overcome my shyness with my strong sense of curiosity,” she said. She started working at the Times of Trenton in 1999 as a sportswriter. She moved to news about a year later, covering a variety of beats, from municipal government and schools to religion and county government. She was the computer-assisted reporting expert in mid-2006 when she accepted a buyout from the Times. At 39, she was the youngest person to take the buyout. “I decided to leave when I found out the newsroom was shrinking from more than 100 staffers to about 35 people,” she says. In 2009, after the Times experienced another round of layoffs, she returned on a freelance basis to cover Princeton. 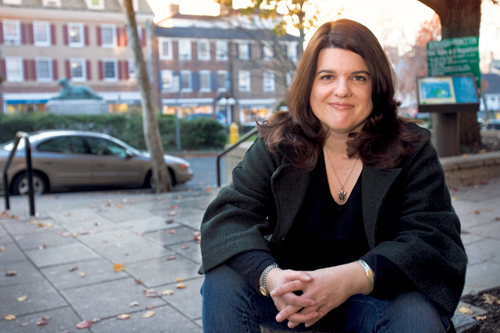 In 2011, she quit writing for the Times to start Planet Princeton. The Princeton Echo chatted with Knapp about the experiences she’s had since starting up Planet Princeton — the past and the future, the highs and the lows, the myths and realities of running a solo 24/7 news operation. We also talked about the state of journalism in general. The interview has been condensed. Princeton Echo: As I recall, your coverage of Hurricane Irene helped put Planet Princeton on the map. Krystal Knapp: I had received a fellowship funded by the Ford Foundation to attend the Poynter Institute for Media Studies with other would-be journalism entrepreneurs that year. The lessons I learned at Poynter helped me think about how I would run a local news site and what I would cover. I was still working out my business plan when Hurricane Irene hit. I knew if power went out and there was flooding, the only connection people would have to the outside world would be their cell phones and tablets — while they still had power. I crowdsourced information and photos. I lost power at my house and had to move four times to find. I worked two days from my car, outside the Panera at the Hamilton Marketplace, so I could use their Wifi. I forgot my lights were on and my battery went dead. I posted an SOS on Facebook and a friend from the Anchor house ride who lived nearby, Pat Worth, saw it and came over with some jumper cables. Friends in Pennington offered me a place to report from until my power was back. My website was only in beta. I had just opened a Twitter account the week before, and had about 300 followers on the Planet Princeton Facebook page, mostly friends. A few days after Hurricane Irene hit, I had almost 3,000 followers on Facebook and more than 2,000 on Twitter. PE: What do you remember thinking after you had time to recover from that? KK: I didn’t have time to think right after Irene much because things were moving so fast. I was exhausted. In hindsight I probably took too long to get back to working on future plans. The response did tell me my hunch was correct that there was a place for a new news website in the Princeton news ecosystem that focused on breaking news and accountability reporting and harnessed social media. I started posting on the website on a more regular basis in mid-to-late 2012. Superstorm Sandy hit and again my social media followers doubled. I worked from the basement of the former Princeton Borough Hall for a week, sleeping in a sleeping bag next to the generator so I could keep covering the storm. I slept about three hours a night. The success of the coverage again was crowdsourcing. People all over the Princeton area and beyond were giving me news and tips and asking questions. Readers were offering to help each other. Loved ones living far away were reaching out to find out if their elderly parents were okay. At some point I was receiving so many comments it was hard to keep up. I remember going to the bathroom and coming back to about 50 posts and messages and just feeling overwhelmed. But readers stepped up and helped answer questions, for example helping people with info about gas stations that still had gas. People were also very patient. I also felt my training at a very traditional newsroom had served me well, and I am grateful for the lessons I was taught by veteran reporters there. I knew how to be prepared for crisis reporting after covering a tornado, flooding and the aftermath of Sept. 11 and the anthrax scare for the Trenton Times. PE: Who were some members of the community who really encouraged you or helped you when PP was really getting going? KK: The initial followers were friends and people who were familiar with my byline from the Trenton Times who “liked” Planet Princeton and shared posts on social media. They were a big help in terms of spreading the word. I did not and do not have a big marketing budget, so word of mouth was key in reaching people, both online and offline. A lot of journalist friends thought I was crazy when I floated the idea of a local news website for Princeton. But after Irene and Sandy, many of these same journalists became cheerleaders. When you are striking out on your own and taking big risks, having that kind of support is very helpful. PE: A lot of websites, including some that were very well funded like Patch, were unable to succeed with hyperlocal news coverage. Why do you think you’ve been able to build a following where other sites have failed? KK: Patch had too many layers of management, plus a cookie-cutter model. Each site looks almost identical to the others. Each community is unique and has different needs and interests. I believe a healthy news ecosystem has multiple players. It’s not good for anyone if there is only one source of news in a town. In more and more towns and some poorer cities, there is no source of daily news. The number of news deserts is growing, and that keeps me awake at night. The role of the press is critical to the health of democracy, and that is being threatened right now. Newsrooms with smaller staffs don’t have the same resources to dig that they once had. I am a lean operation, so I can be not as worried as a corporation about my bottom line. Of course, sometimes when I look at my bank statements, I get worried. I’ve put a lot into Planet Princeton and frankly I’m not making anything near what one would consider a salary after my expenses. But it is not a sprint, it is a marathon. I’ve freelanced and done social media consulting and other professional writing to support what I do at Planet Princeton. I was exhausted and my health suffered because of it. I was quite ill last year. For more than six months, I spent most of the day in bed. I’d feel exhausted and out of breath if I walked a block. It was a very scary time for me and it was very difficult to keep things going. I’d have enough energy to post a few stories a day if I took naps between stories, or I could go out to one coffee meeting and that was it for the day. Of course that made me wonder about what happens if there is no me to run Planet Princeton. That has very much been on my mind as other website founders who are friends close down because they are burnt out or want to retire. I am looking at ways to make sure that Planet Princeton will go on even after I am no longer part of it. Fortunately I have enough readers now that the website is an attractive place for advertisers to post ads. I also am fortunate to have a great deal of reader support. More than 200 readers supported a crowdfunding campaign that helped me make a lot of important technical upgrades, and their support enabled me to be more aggressive about seeking public records because I have a fund in case I need to pay for copies or certain legal fees. Now I have a voluntary subscription model that is catching on. If a reader is willing to pay money to a print publication for a subscription, why not an online news site? Newsgathering can be expensive, especially investigative or accountability reporting. Marge Smith, a mentor in the nonprofit community who founded the Community Works conference for nonprofits, has played a very important role in my life. She has been both a role model and a sounding board. She encouraged me to follow my own path, helped me tap into my strengths, and helped me network with others who could give me good advice. PE: Even major dailies haven’t consistently shown the ability to grow profits online. KK: I am a journalist at heart and have had to work to become a business person, though I definitely have an entrepreneur’s mindset when it come to creating things. But I don’t want to sugarcoat it. It has not been easy. Fortunately I don’t have a mortgage or debts or kids to support, or it wouldn’t be possible to continue. I’ve sacrificed time visiting my family and some of my personal relationships. But I feel very strongly that journalism is a calling, particularly in these challenging times. My biggest struggle is finding an ad sales director. I don’t want to continue to play the role of ad salesperson and journalist. I’m willing to share a decent percentage of my profits with someone willing to do that. This is the challenge almost every local online news startup I know of faces. The most successful ones have been run by husband and wife teams where one person is the editor and the spouse is the ad sales director. Whenever I get discouraged I receive an email or message from a reader thanking me for what Planet Princeton does, and that keeps me going. PE: When did you realize that you had a major scoop when you were reporting on Nancy Snyderman? KK: A reader tipped me off that she was coming back from Africa and had agreed to a voluntary quarantine, and that she lived in Princeton. Otherwise it wouldn’t even have been on my radar. A few days later, a reader posted a comment about spotting her at lunch time. I didn’t make much of it, figuring people were feeling anxious and it could have been a case of mistaken identity. But a little while later a very reliable source called me and was able to give me all sorts of details about the incident in Hopewell Borough. She described the vehicle, which was double parked outside the Peasant Grill, and Snyderman’s reactions to being spotted, and the cameraman in the back and the one who went in to get the food. I networked with sources to get more information and confirm she had left the house, and I contacted NBC and waited for a response for several hours. When I had confirmation through some town sources that she had been confronted about leaving, I knew I could go with the story. PE: Shortly thereafter, you launched a fundraising campaign. KK: I realized from that experience that as much as people love a particular new site, there is just not a mindset that people need to support news by paying for it somehow, whether is is through a voluntary subscription, a membership, or looking at ads. I’ve have a few readers contact me asking me to remove ads from my site or telling me they use an ad blocker. Yet they are not taking out voluntary subscriptions. People need to think more about how news is funded and ways to support it if they truly care about it and want to see news sites continue to survive and thrive. I’m very fortunate that I have a strong core of loyal readers and supporters. That said, if 10 percent of my readers took out subscriptions, I could do a lot more in terms of stories and investigative projects. PE: How did you get hooked up with Princeton’s University Press Club? Their coverage of the Woodrow Wilson sit-in on campus last fall was some of the best done anywhere. KK: I was asked to be a business coach for the Press Club in the summer of 2014. The Press Club is the only organization I know of that’s like it on a college campus in the U.S. It is a group of students who are professional freelancers. The club has been in existence at Princeton for more than 100 years. I was hired to help the club navigate the difficult transition to the online world. The club faces the same challenges we all face as journalists in the Internet era. It has been a joy working with the students for the last two years. I’ve coached them on pitching, developing story ideas, and working with editors. The students consult me when they have questions about how and when to approach editors about stories. During the sit-in, I played the role of cheerleader and coach, but the work was all the students’ efforts. The members consulted with me regularly about pitching sit-in stories to editors. The successful sit-in coverage was the result of three semesters of hard work by the students. PE: Take us through the first few days of the Imani Perry incident. Did you immediately recognize that you had a major story on your hands? KK: I was sitting at home on Sunday and I received a Facebook message from a reader who works at the university. I looked at Perry’s tweets and retweeted. I tweeted to Perry to contact me. No response. I waited to see how things played out. It was Super Bowl Sunday. I wanted comment from her and the police of course. I was particularly cautious about reporting until I had all the facts because of the issue. And of course I knew there would be dashcam footage and I knew I needed to request it. I don’t quite think I anticipated how big this story would become. I was glad I waited to have both Perry’s statement that she posted on social media about the incident and a response from the police chief in my initial story on Monday. Some stories that ran in other publications online on Sunday did not include any response from the police or details about the incident. PE: The Perry incident seemed to really bring out the worst in people on social media. KK: I moderate comments heavily on my site. I get an email every time someone posts a comment. I have filters set up. I sometimes remove comments. Readers now and then claim I am violating their free speech or promoting censorship. But I believe the media has a responsibility to promote civil discourse in this country. People can make their points without using personal attacks. I don’t believe in an all or nothing approach. Some people have told me I should not allow comments. Other news websites have been making that move lately. But often, website comments are helpful and can add to a story. But the Perry incident was the first time I have ever had to turn off comments for a story. Once the story went viral, and national media outlets linked to the Planet Princeton stories, Internet trolls from other parts of the country began commenting, and some of the comments were just horrible. Lots of racist comments making generalizations about African Americans were posted. Some of Perry’s supporters also posted horrible comments attacking readers who posted mild comments criticizing the professor. Readers on both sides also kept flagging comments they thought were offensive that were actually pretty mild. The country appears to be so polarized, and the media is part of the problem, amplifying the voices at the extremes. When I worked at a newspaper I might get a phone call, a letter or an email about a story. Now I get tons of messages on social media and hundreds of emails a day. In many ways this is good. PE: Planet Princeton got caught in the middle. KK: Critics and supporters of Professor Perry both bashed me for my stories. Her critics accused me of playing the race card, while some of her supporters called me a racist. As the saying goes, if you are making both sides unhappy you are doing something right. That doesn’t mean it makes it any easier to read such comments. I’ve developed a pretty thick skin for sure, but every now and then a comment will get to me. I’m human. PE: The proliferation of corporate communications departments and government “spin doctors” also make it increasingly difficult for reporters to get at the truth. Could we reach a point where governments and companies eventually “control the message” as they are out to do? KK: With social media, people and brands have direct access to the public. What is the role of a celebrity journalist when the celebrity can post pictures and info. directly to twitter? My answer would be the press should direct more efforts to providing context, examining the truth of statements, and accountability reporting. This of course requires more resources than covering politics like it is a tennis match, for example (he said, she said). So many journalists have lost their jobs. Many of them landed in public relations. We are way outnumbered. P.R. people can sometimes be very helpful when you are trying to get information as a reporter. But in many cases they just want to control the message and promote a brand or person. I am bombarded with press releases every day as I am sure you are. An issue that is just as worrisome is bloggers and news outlets posting stories or information online and on social media promoting paid advertisers and not disclosing that someone is paying for the story or the social media post. This is not only unethical, it is also a violation of federal regulations. It is fine to post a story about an advertiser or a social media post as long as the blogger or outlet discloses that it is sponsored content. 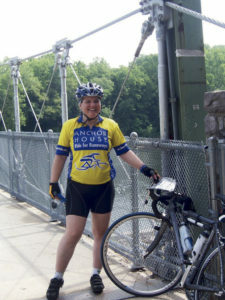 Krystal Knapp on the Anchor House Ride for Runaways, 2012. PE: What is a typical working day for you like? KK: I wake up around 6:30 to check social media and post anything from meetings the night before. After rush hour is over, I will read the news and make phone calls and write. I go to a lot of events and meetings. I like to have days where I just work, with no interruptions. But I try to meet people regularly as well. I once realized I’d been working from home in my pajama pants for 4 days in a row. I forget which big story it was. I constantly feel I am never doing enough and there is always more I could be doing. I work from my home office in Princeton a lot, but also try to leave and work at a cafe or library regularly. I also work at the co-share space Basecamp, in Trenton. I’m very productive and focused when I work there. Even though I work crazy hours, at least it is my choice and I can decide what to do with my time. I’m my own boss. I can take a few hours off in the middle of the day or a day off here and there. I take an afternoon nap every day. I can also keep up wherever I am. When my Mom had her heart valve replaced a few years ago, I didn’t have to take family leave. I worked from the hospital and rehab facility. I was more obsessive, but after I became ill last year, my priorities changed. I felt I was getting burnt out. So now I try to have more down time to read, bike, catch a movie or concert, or hang out with friends. By doing those things, I’m more productive when I work. Some of my colleagues who were running profitable local news websites quit because they were so exhausted. I don’t want that to be me. I feel lucky that I am passionate about what I do and the community I live in. Sometimes it is a struggle. But then I think about what a gift it is as a journalist to have access to people’s lives in so many ways and to be exposed to so many different things. I also think of my grandmother, who worked on the assembly line for Chrysler for many years. She took great pride in that job but it was work. Having a job one loves is a luxury many people don’t have.